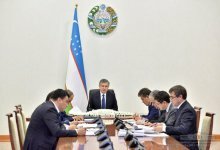 At the meeting that was held on June 21, the President of the Republic of Uzbekistan Shavkat Mirziyoyev noted the need for accelerating each project introduced in the list of investment and infrastructure projects approved for this year, in implementation of which slowness was allowed. Specific tasks have been set on financing construction and timely commissioning of affordable housing in rural areas and cities, water pipelines, social facilities. Within the framework of programs, developed following the results of trips to the Republic of Karakalpakstan and the regions, it is envisaged to implement 6 thousand 317 projects on integrated development of these regions in 2018-2019. As a result, it is planned to create more than 219 thousand jobs. It was emphasized that it is necessary to allocate space for important projects of socio-economic importance, to timely resolve work on connecting them to infrastructure networks.